WASHINGTON, Feb 14 2013 (IPS) - In Africa’s Sahel region, agroforestry techniques using traditional plantings known as “fertiliser trees” to increase soil fertility, as well as harvesting and grazing regulations, are offering new solutions to both food and human security. The effect for local communities over the past 20 years has been immediate and staggering—”more than 500,000 additional tonnes of food per year,” Reij said. Collectively known as “evergreen agriculture”, these techniques have not only been changing landscapes and breathing new life into soils long depleted of their nutrients and productivity, but also affecting political and social realities. The ideas behind evergreen agriculture began during the 1980s, in the midst of a severe and prolonged period of drought in the Sahel. This period was disastrous for the region’s inhabitants as crop production plummeted and vast numbers of livestock had to be killed off. The region’s trees also began to disappear, since local communities were forced to offset their lost assets through practises that slowly destroyed the forests – the only profitable resource left in the Sahel. These communities resorted to cutting and selling wood to buy food and survive, with multiple effects of this deforestation felt in the intervening decades. For eons, farmers in the Sahel grew trees on their farmlands because they acted as a natural fertiliser. Not only did they improve fertility by adding nitrogen to the soil; they also offered a critical shading effect, which improves moisture conditions in both the local atmosphere and the soil. Buffering crops of maize sorghum and millet below them, the trees used by farmers in the Sahel are unique and known as Faidherbia albida. According to the World Agroforestry Centre, the tree exhibits the unusual characteristics of becoming dormant and leafless in the wet season – when crops are growing – but leafing out thereafter, when farmers can harvest the trees’ leaves and pods for fodder for their livestock. When scientists began looking more closely at this phenomenon, they discovered a virtual underground ecosystem in these areas, with root systems and perennials from various species of valuable indigenous trees, which farmers can now cultivate. These trees grow naturally each year, and with the grazing of livestock managed to give the trees time to grow, the landscape is being transformed, with the implications of this growth possibly extending beyond food security. Africa’s “drylands”, the vast swath of the Sahara Desert stretching across North Africa from the Atlantic Ocean to the Red Sea, have risen in the past year to the top of the global agenda. The insurgency in Mali and the ensuing French military intervention have received the most attention recently, following kidnappings in Algeria and wars in Mauritania and Niger. “If you look at the dimensions of where terrorism and political insecurity are most acute, throughout the entire globe, it is a map of the drylands of Africa and West Asia,” Dennis Garrity, U.N. Drylands Ambassador and director-general of the World Agroforestry Centre in Nairobi, said at a recent event here in Washington. While the Sahel suffers from both an accelerated degradation of land and low rates of female literacy, these two indicators aren’t generally conflated. Yet according to Garrity, a connection can be found in factors such as high population growth rates. According to the World Agroforestry Centre, the population in the Sahel doubles every 20 years, a rate that is reflected in the rapidly declining size of farm plots on which rural communities depend for food. Meanwhile, availability of new farmland is rapidly dropping, and studies regularly report a steady decline in soil fertility. Above all looms the long-term prospect of the region’s vulnerability to climate change, making these agroforestry initiatives all the more urgent. 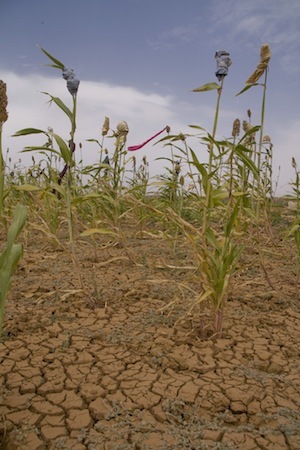 Garrity and other experts warn climate change will play out in terms of more extreme droughts – higher temperatures and low and uncertain rainfall – that will significantly affect crop yields.